I have been a fan of musical theater as long as I can remember. I grew up in a house that always had some cast recording playing – my mother was a big fan. And as long as I can remember I have been a fan of the great Andrew Lloyd Webber and admire him greatly. So I was thrilled to pick up his memoir, Unmasked – A Memoir by Andrew Lloyd Webber, to read his firsthand account of his life and the amazing contributions he has made to musical theater and indeed our popular culture. I have said it many times before, I love a memoir from a great artist talking about the creative process. Lord Webber is about as great an artist as we have living among us. By the way, some time ask me about the time a very young Lost Cowboy sat next to Lord Webber during the first half of a show in Boston, circa 1990. 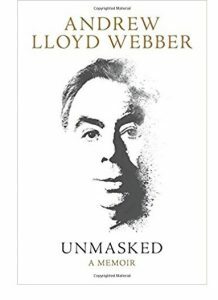 Unmasked – A Memoir by Andrew Lloyd Webber is available from Amazon and other fine booksellers. Lost Cowboy is powered by	WordPress 5.0.4 and delivered to you in 0.795 seconds using 40 queries.